Snow performance is the proud leader in Methanol Injection kits for both gasoline and diesel vehicles. 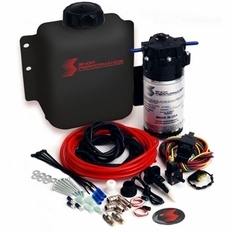 When you buy a Snow Performance Boost Cooler, you get a complete kit right down to the reservoir and sealant. Also, Snow Performance has more kits for specific applications than anyone. Eliminate the guess work - get a kit for your vehicle complete with installation instructions that include vehicle specific photos and performance backed-up with dyno charts. Snow Performance also offers a lifetime warranty on their kits. Why is a Snow Performance Methanol Injection Kit better than the competitions Methanol Injection Kit? Each Snow Performance Methanol Injection system has been designed and tested by engineers to ensure reliability and robustness. The Snow Performance Boost Cooler� will do what it should do for a long time. No failure prone brass, or rubber, is used in these top of the line kits like the others, and Snow Performance component flow rates are calculated and spec�d to work in sync with your engine, giving you the results you want and need. Furthermore, Snow Performance Digital Variable Controllers are made for specific applications - Not just boost actuated, Snow Performance has specially designed their premium controllers for each vehicle/application to ensure maximum power. Unlike the competition, most Snow Performance Methanol Injection controllers feature true 2D maps facilitating the most correct injection and power under all conditions, making Snow Performance Methanol Injection Kits the most advanced methanol injection systems available on the market. What are some of the key benefits to using Water/Methanol injection? 2. Low cost power - Where else can you get 70-100 HP for as low as the prices these kits run? 5. Great for towing - more power/cooler EGT's to haul the heaviest loads. 6. Raises effective octane of your fuel to as high as 115 octane- You'll be able to boost that turbo or supercharger much higher. 7. Designed specifically for your vehicle to ensure the best performance and fit. 8. Safe to use and easy to install.